This is the 16th week of the MBIP Chicken Tour which means it marks the four month mark. Nine more months to go and we’re done with this whole motherclucking tour! 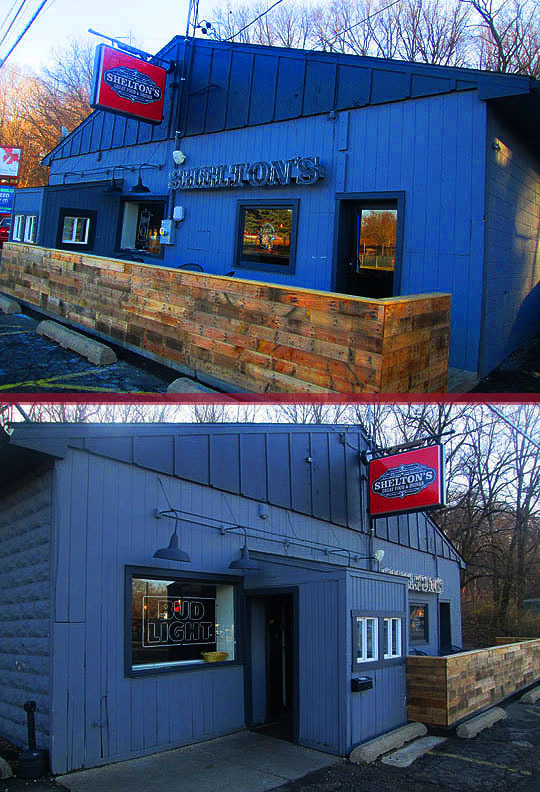 This week we’re headed down to Farmington Road to Shelton’s to try their unique twist on a classic Italian chicken dish: Chicken Parmesan! Here we are at Shelton’s on Farmington Road. Okay, we’ve looked at Shelton’s from both sides now, from win and lose and still somehow...I want to get inside and eat some chicken, so let’s get the cluck in there! As you enter Shelton’s you can see the dining area over to the left of the room, but I’m dining solo today, so I thought I’d sit at the bar. There’s some seats there at the end of the rectangular bar, so let’s go snag one and get settled in. Stephanie was one of the pretty bartenders on duty and she brought me an iced tea and took my order. She told me that the Chicken Parmesan was a popular entree here at Shelton’s. Okay, while that’s being prepared let’s wander around a little with the MBIP Camera and take some photos of this place. There’s another dining area over on the other side of the bar complete with tables and large wooden booths. There’s also gaming machines in the back of the room if you’re feeling lucky! Here’s the back of the bar and as you can see there’s a nice selection of ten beers on draft to choose from. Matt Weaver who owns Weaver’s came out from the kitchen to say hi. He told me business has been great and he’s enjoying running the bar and restaurant here on Farmington Road. He told me that the Chicken Parmesan is a specialty here so I’m really stoked to try it now! There’s a lot of fun things to look at on the wooden walls in here including articles and photos of the Shelton gang which the bar is named after. At the bottom is a photo of Bernie Shelton who was famously gunned down right outside of this building when this place was the Parkway Tavern. You can read more about Bernie and the Shelton gang by clicking here. 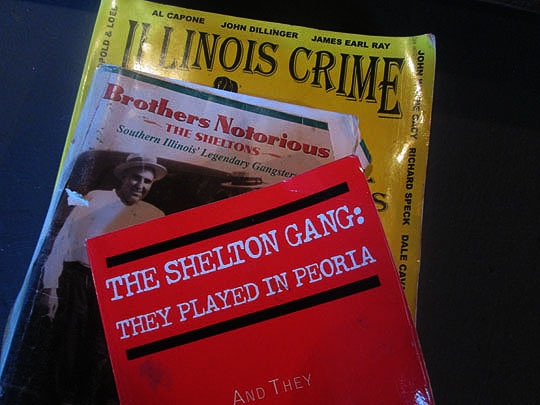 In addition to the writings and photos on the walls, there’s a pile of books on the Shelton’s for your perusal. Official Shelton’s t-shirts are for sale behind the bar. Speaking of the bar, let’s get back to our seats because the other pretty bartender on duty, Bre is serving up our Chicken Parmesan lunch! The Chicken Parmesan looks fabulous. 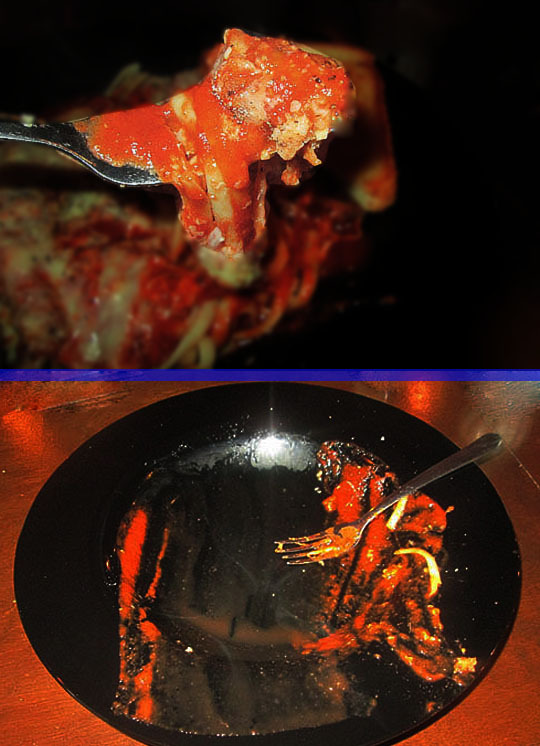 It’s a unique twist on this classic Italian dish. It’s made with their signature hand-breaded chicken fingers and topped off with their homemade red sauce and a melted blend of pizza cheese. It’s served on a bed of pasta and there’s two slices of Texas toast on the side. Okay, I can’t wait any clucking longer, let’s dig in! Wow, this is so delicious and tasty! There’s a wonderful combination of flavors going on! The chicken fingers are savory with the red sauce and melted cheese adding a rich creamy pizza taste and the pasta is a nice base for the dish. This is so flavorful and really a satisfying meal on a winter afternoon! I didn’t think I could eat the whole thing, but I ended up mopping it up with the Texas toast. This is definitely one of the best Chicken Parmesan dishes I’ve ever had! But that’s not the end of this chicken dinner. As I was leaving, Stephanie gave me a package and said it was a gift from Matt! Very nice and let’s fast forward to the next afternoon to take a look at this gift! Fast Forward To The Next Afternoon! Okay, it turned out to be an edible gift and it was a to-go box filled with Shelton’s signature Chicken Fingers with two different sauces! Let’s warm these up in the microwave and sample them for lunch here in the official MBIP World Headquarters Taste-Testing Kitchen! These are definitely not your every day generic chicken fingers! They’re hand cut and breaded and made with a Baton Rouge recipe. The breading is light, crispy and has a nice seasoned flavor. Inside the chicken is plump, juicy and delicious. Especially when you dip them into their house-made Tyler’s Sauce. When you hear the words, “Chicken Fingers” you tend to think of something that a child would order, well while kids would love these, I think of these as adult Chicken Fingers that are quite addicting! Four Dixie Chickens—The Chicken Parmesan at Shelton’s is a one-of-a-kind take on a classic Italian dish. If you haven’t tried it, stop in and it will blow your clucking mind! And then get an order of their hand-breaded Baton Rouge Chicken Fingers to go, they’re great for lunch the next day! Related Posts: 13 Months of Chicken @: Sky Harbor Steak House, McDonald’s/Chik-fil-A, Bernardi’s Pub, Harold’s Chicken Shack, Lariat Steakhouse, Donnelly’s Irish Pub, Thanh Linh, Grandpa John’s Rib Shack, Birdie’s Bar & Grill, Jalapeno’s Mexican Grill, Midway Duck Inn, Ludy’s Kickapoo Creek Saloon, Jubilee Cafe, Rizzi’s and Agatucci’s.